When I started researching stocking my pantry, I ran across a reference to powdered peanut butter. Images of astronaut food and hikers came to mind, but the idea of having a very shelf-stable product appealed to me. And then I read a description of what reconstituted peanut butter tasted like. I’d sooner help myself to a bowl of wet cement. I mean, I’d be happy to have it during a nuclear winter, but, I wasn’t tempted just yet to load the pantry shelves with it. So I gave up on that particular idea and decided to stock up on the jarred variety instead. Its shelf life is pretty decent and in our household, there would never be a problem of rotating the jars – we consume the stuff too fast. 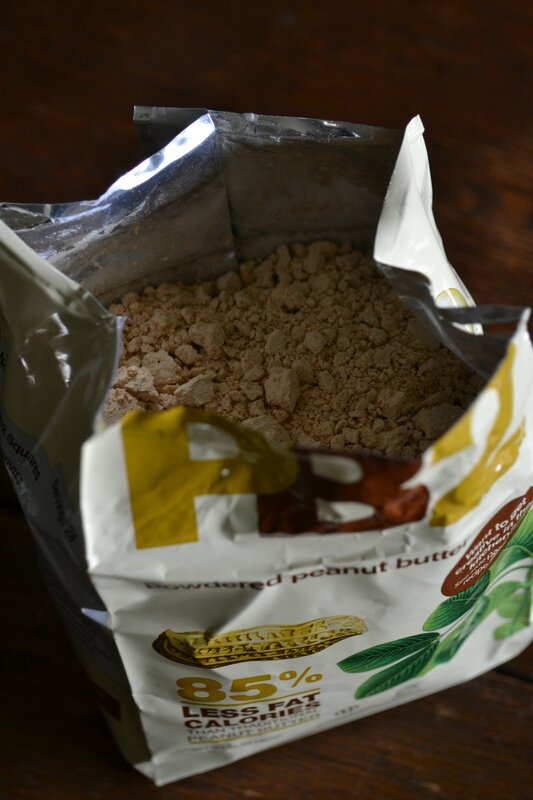 And then PB2 brand powdered peanut butter was profiled in my April 2012 issue of Nutrition Action Healthletter that gave it a rave review and I knew I had to give this product a try. Amazon.com had a deal where you could get the regular peanut butter powder, plus a peanut butter-chocolate powder and a small bag of peanut butter “thins” for what seemed like a reasonable price – it’s not a cheap way to buy peanut butter, however. (Whole Foods sells it or you can purchase directly from the company.) I just got the products a few days ago. Since I’m always on the lookout for ways to reduce artery-clogging fat from our diet, these powdered products were especially appealing – because they have less calories from fat than jarred peanut butter (16g of fat in 2 tbsp. of the jarred natural peanut butter I currently use compared with 1.5g for the same serving size of PB2. Wow.). The amount of sugar (1g per 2 tbsp. – the same as the jarred stuff) is pretty decent. …our special process removes 85% of the fat calories without the chemicals typically used in producing reduced fat foods. Something else you won’t find in PB2 is preservatives. So I spent the morning messing around with the powders and my camera. The powder smells good and has a nice, soft consistency. It was quite easy to stir together and it smoothed out nicely. The finished product looks just like what you’d scoop out of a jar. I even added roasted peanuts to one batch. The chocolate version was thinner than the peanut butter one, but adding a little bit more of the powder thickened it up. If you’re wondering about the (tiny!) peanut butter cookies/crackers, I found them ridiculously sweet. I might turn them into a pie crust base, however. Peanut butter chocolate creme pie anyone?? This is all well and good, right? But does it taste like wet cement? Happily, no. Not even close. However…I also didn’t detect a whole lot of peanut butter flavor. Eating it made me want to scoop up a big spoonful from my jar of peanut butter and snarf it down. As for the chocolate peanut butter, it was kind of the same issue. Not much chocolate flavor, not much peanut flavor. And there was just something…off about the texture of both spreads. Obviously fat adds flavor and it adds creaminess. Is PB2 acceptable? Yea, sure. It is great to have in the pantry and certainly for traveling it would work quite well. And if one is looking to shave fat calories… Will I use it every day? No. Despite my love of peanut butter, I keep consumption to a minimum, so I’m not too worried about the fat content. What I really want is delicious, nutty peanut butter. I am curious about baking with it. As I mentioned, Bell Plantation has a whole heck of a lot of recipes on their site. It’s probably worth baking with both products – or trying them in smoothies – for a more complete taste test. Get PB2 Powdered Peanut Butter here. Get PB2 Powdered Chocolate Peanut Butter here. I love peanut butter. When I am in the mood for something sweet it does the trick and it also helps me control cravings until dinner (1 teaspoon). I didn’t know about this powder pb. I am not sure if I would like it, reminds me of fake mash potatoes, but it might be good to have around since the shelf life must be longer. Nice post, love the pictures. I do the same thing – have some peanut butter for sweet cravings. As far as this powdered stuff, at least there are no funky ingredients in it, but it’s strange to me that the peanut taste is just not really there. I have never tried the stuff, but I have been tempted. I’ve heard so much about it as a protein source in smoothies instead of using a typical protein powder (full of goodness knows what?! )…… I guess I haven’t given it a try yet because I haven’t found in stores around here. Even my trusty health food place doesn’t carry it yet. Love to know how it works in baking. Don’t know if would bother using it to make regular ol’peanut butter — think I would just stick to the jarred kind. Right – I’m thinking the same thing. Keep it for baking and smoothies. I haven’t seen it locally either, but will check next time I make it to Whole Foods in OKC. It sounds as if it would be really good for baking with, I’ll watch what you do with interest! The peanut butter I eat doesn’t have sugar in it, and the saturated fat isn’t too bad (it is high in fat, but it’s the saturated stuff you’re trying to avoid, I guess?). It’s called Whole Earth, I don’t know if you get it in the States but it’s really nice and it is sweet enough without sugar, I reckon. Mind you, we use it as a sandwich filling so more of a savoury than a sweet, but the smooth stuff (the kind I prefer), has a lovely creamy texture. Here’s the website if you fancy a peek: http://www.wholeearthfoods.com/ It’s vegan too! Thanks, Lorna! I use Smucker’s brand which also contains no sugar – just peanuts and a little salt. It’s amazing how one’s taste buds adjust when restricting sugar in the diet. I figure for the amount that I eat, I don’t “need” to worry too much about the fat content. It would be tough to give up the “real” thing. I think it’s the same with salt, I’ve cut down on the amount I eat and it’s amazing how at first things seemed bland but now I can’t bear things to be too salty. There are so many other subtle flavours we miss out on from chucking in too much salt or sugar. Right! I’ve also cut way back on salt, limiting it mostly to baking bread (cuz bread without salt really IS bland). I think it’s fine as long as you go carefully isn’t it? We do need a bit of salt after all, it’s just unfortunate how over the top some people are with it, especially in fast food. I’ve had bread without salt in it (missed out by mistake!) and it wasn’t very nice, as you say. Well I never! Did’nt realise there was such a thing as powdered peanuts. OOOOOOOHHHH! This stuff has been all over the blogosphere and I’m dying to try it! I love that you showed the steps to reconstituting it! Your photos look simply divine! Thanks! If you do try it, let me know what you think! It has got potential, I think! I know this is a pretty old post, but I had it bookmarked for when I got my hands on some of this stuff, and I finally have! Noelle at Opera Singer in the Kitchen sent me some 🙂 I will definitely be experimenting with it a lot in the coming weeks! Thanks for your review! I remember a peanut butter based sandwich filling I think it was called nuteena or something like that from a vegetarian food company it was canned and you sliced it or chunked it up for stir fry. Haven’t seen it in years but would like to try making it myself. Any suggestions I would think it could be steamed in a coffee can or baked. it was very smooth textured so I think the powered peanut butter could be an excellent start. Hi Jan – wow, that’s a new one on me! Nuteena – gotta Google that. The powdered variety has tons of possibilities – stir fry sounds like an interesting way to use it. Anyway, thanks for getting me thinking ;-)!